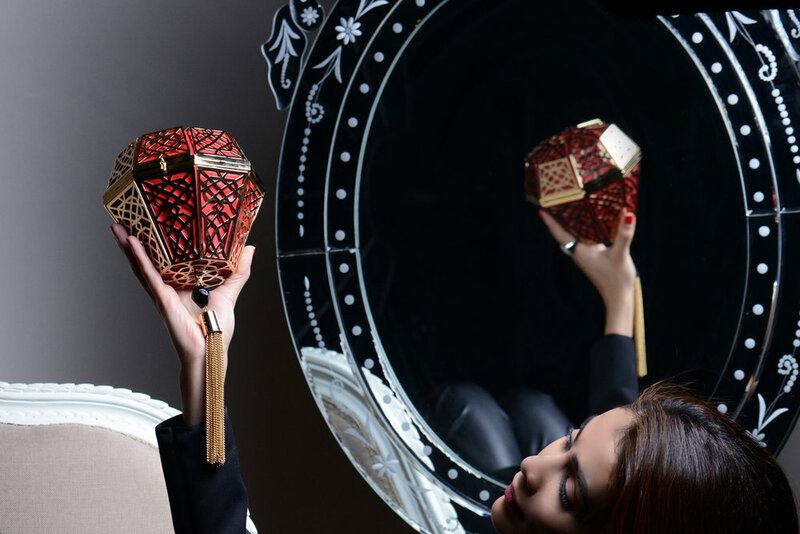 Noof Al Shekar is a Bahraini handbag designer who launched her eponymous line in 2010. Since childhood, her fascination with design and the patterns that occur in art, architecture and the natural world was heightened by her passion for sketching and painting. Initially, her instinctive grasp for all things mathematical encouraged her to pursue an academic career in architecture, though in the meantime the sumptuous little jewel bags she was designing for herself were quietly gaining a fan-base, eventually persuading her to devote full time to designing her own bespoke collection. Since the brand’s inaugural collection, Noof’s designs have been influenced by her opulent Arab heritage and inspired by the sacred geometry in Islamic architecture and the earth’s natural gemstones. With her meticulous attention to each design process, Noof creates the sketches and mock-ups from her Bahrain-based atelier and travels across the globe in search of the finest materials and gemstones. Working closely with a small group of master craftsmen to produce each hand-made clutch and overseeing every detail, she creates a limited number of perfect clutches that marry bag with jewel. The result is a collection that re-imagines the handbag as a piece of jewelry, and gives new expression to the clutch as a masterpiece of wearable art. Noof resides in Bahrain with her four children.